In an era known for its spectacular uniform, that of the Guards of Honor of the Napoleonic Kingdom Italy surely deserves special mention. Their creation was first ordered by Napoleon in June 1805 in his new role as King of Italy. There were initially 4 companies of 100 men, one each from Milan, Bologna, Brescia, and Romagne. Later a 5th company, designated Venice was added. These companies served to guard the royal palaces in peacetime, but were attached to the Royal Guard during wartime. They were recruited from the aristocratic youths of Italy, thus in some ways presaging the French Guards of Honor of 1813 - 1814. The early uniform consisted of a coat ion various colors by company, with facing colors on the collar, cuffs, lapels and turnbacks, much white lace ornamentation, and a bicorn hat edged in white lace.. These uniforms, as well as the later ones, are well illustrated on the Nap Italia site. In 1811, a new uniform was introduced, having considerable similarity to the equally spectacular new uniforms of the French Carabiniers. A similar brass helmet with a black crest and white plume was worn, with the comb of the helmet being in the form of an eagle with outstretched wings. and a white metal turban bearing a brass metal "N" on the front, brass chin straps, and a back visor trimmed in brass completed this impressive and rather unique head dress. A white plume was worn on the left side for full dress. The rest of the uniform was in the style of the French Dragoons, with dark green coats, white belts, waist coats, gloves, and pants./ Each company had its own facing color, as listed below, which appeared on the collars, cuffs, lapels, turnbacks, and the edging of the pockets. There were 2 white lace bars on either side of the collar, and white lace on the button holes. There were brass scale epaulettes on a background of the facing color, and, for full dress, a yellow cord aiglette was worn on the left shoulder. The horse furniture was dark green with white trim and a white Iron Crown of Lombardy device in the rear corners. For officers, silver replaced the white of the lace and shabraque trim. Trumpeters wore yellow jackets* faced light blue, with light blue shabraque and white trim, and a white crest to the helmet. To my knowledge, no manufacturer makes a figure entirely suitable for these troops in any scale. The closest figure that I have seen is that of the 1815 Dutch Carabiniers by Perry, and that is what I used for my version. Guardia Reale di Onore... a la Perry! Unfortunately, these figures have their overcoats slung across their chests. Fine for protection, but it obscures the wonderful colored lapels! I used some artistic license and made these "steel green" instead of grey. The Dutch helmet has a lion on the front of the metal turban. I could have shaved it off, but it was so well sculpted and handsome that I just left it on in place of the brass "N". The "eagle comb" of the helmet of course is also absent. There are no aiglettes either, but we can just assume they were left off for field duty. Finally, the figures have full epaulettes; rather try to carve them of I left them, and painted them silver over the facing color, so not quite right but close enough! I have painted one stand in each of the 4 company colors - Milan (pink), Bologna (yellow, includes the Trumpeter for the unit), Brecia (buff, includes the standard bearer, a minor conversion as the Perry command set lacks same), and Venice (orange). What about Romagne (scarlet)? We'll come to that later! The Osprey even shows a black and white photograph of a Trumpet banner of this unit, captured by the Prussians in 1813. To me it looks like it is in the facing color. On one side is the Iron Cropwn surrounded by laurels, and on the other is the inscription "GUARDIE REALI D' ONORE" (sic), also surrounded by a wreath. and the other side has an inscription reading "GUARDIA REALI / D' ONORE"
On Blue scrolls above and below trhaty are inscribe "valore e disciplina" above, and "1 squadrone" below. I used the infantry flag form Warflag/Napflag, edited it in MS Paint to remove the corner emblems and central inscription and add a fringe, and then painted in the inscription on the crowned "N" emblems by hand. Since the Perry figures come in sets of three, and my cavalry units have 8 figures, that left one figure left over. I used the officer figure and painted him in the scarlet facing color of Romagne. Here you can see the fine detail of the silver lace decorating his collar. Here, at least, the full epaulettes in silver are correct, I think. As a high ranking officer, he has replaced his black horse furniture with dark red leather, reflecting the facing color on his coat. This way I have both an example of the Romagne company uniform, and another Commander stand for my Italians. And, of course, he comes accompanied by his very own cane di guerra! When you think of Carthage, who doesn't think of Elephants? I sure do! These are Minifigs, as is the bulk of my Carthaginian army. In reality they were a fairly minor aspect of the Carthaginian military, but I still built a large Elephant Corps for them, as seen above. Certainly Hannibal's greatest use of them, at the Battle of Zama, was also his biggest defeat. We now believe that the elephants used by Carthage were largely or exclusively the smaller, now extinct African Forrest Elephant, and that howdahs were not used. At the same time, countless images over the centuries have depicted them this way, so who am I to argue? Portly posteriors of the ponderous pachyderms! On the other hand, these rather plain looking troops are the famous Numidian (light) cavalry. I made a crude "Leopardskin" cape for the Leader from paper. I got the idea from one of Charlie Sweet's Numidian units! I actually need more of these guys; surprisingly, many 25/28mm manufacturers don't seem to make them, plain as they are! Once again wearing white tunics with purple borders, and red-brown leather boots. The finely cast, slender javelins have taken some wear over the past 30 years. I actually have 2 more figures of these troops who were AWOL during the photo session! Their yellow tunics were evidently typical. ... as were the striped and checked cloaks. I had more patience painting these patterns back when, it seems! "Spanish" (Celtiberian) Medium Cavalry. The dress of these fellows is rather similar to that of the Scutarius with their long black cloaks. Once again the purple and white tunics and leather boots. These Minifigs are cast with short lances more than spears; it's debatable if they were actually used in that fashion, though. These nice figures are by Ral Partha. Yes, there actually is fairly heavy shading on their red cloaks. Probably few in number, along with the Numidians, these were the creme de la creme of the Carthaginian cavalry arm! "And their squadrons were gleaming in Purple and Gold..."
Finally, a Potpourri of Minifigs Balistae, Hannibal himself, and some Eureka Gallic leader figures. I definitely need more leaders and heroes for To the Strongest! The Eureka figures are full of action, aren't they? Here's the entire army on the table, deployed for battle. Attempting more of a Cannae, it seems, despite having the Elephants out in front a la Zama! Carthago renatus est! (Carthage is restored). Of course, using the language of the victors might be a clue as to who really won the 1st, 2nd, and 3rd Punic Wars! My Galley Tally, and a sale on "Galleys and Galleons"
Yep, I have still more ships in this collection - the last four are 15mm galleys by Merrimack/Old Glory Shipyards, and lovely models they are! Equipped once again with banks of "oars" inspired by those on the Bill Abrams ships seen earlier. Mast and sail configurations also inspired by Bill's ships. Note the prominent Ram - ? the Lion (of St Mark) of Venice? The dress of the crew reflects the Turquoise distinctive color of the ship. Actually, ramming was giving way to cannon fire, small arms fire, and boarding actions by this time, but it hadn't disappeared form Naval warfare yet, either! The crew once again reflect the red distinctive color of the ship. Shearing off the enemy's oars was still a viable tactic, and these Abrams style oar banks make it easy top show when a Galley has lost its oars on one side. Thuis Galley is under sail; that would be unusual in actual combat, when the sails were usually furled, and even the masts themselves sometimes shipped. Note the different details on the hulls each of these 4 ships; none are the same. I think there may be as many as 6 different variants. A solid hit by the heavy guns in the bows of these ships could do serious damage to a target, but they were still a long way form the destructive power of a full broadside of the ships that evolved from the Galleass. Once again the colors of the crew's costumes make it fairly easy to identify which ship they belong with. 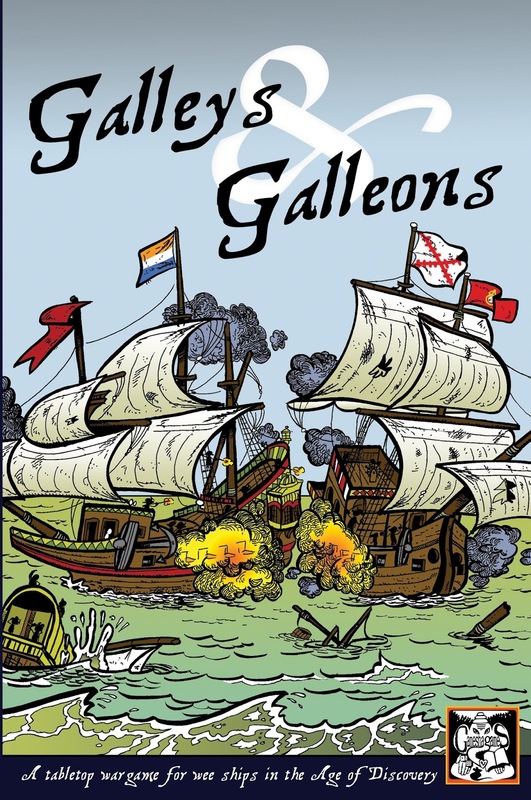 "Galleys and Galleons", a set of fast play rules that could work from Ancient times through the 17th century, is now on sale by Ganehsa Games. At $8 for the pdf, I couldn't resist! They are intended for games where a player commands a squadron of about 6 ships, and to conclude in about an hour. They look like they would give a fun, fast game. I'll give them a table top trial, but I'm pretty sure I want more granular detail. I mostly got them as a source for ideas for a revision of my own rules for my 15mm galleys, and I think they will serve that function admirably as well... or should that be "admiral-ably?" Does this paint job make my Galleass look fat?